Founded by a team of creatives and industry leaders, Smashworks was developed to make the creation of visually stimulating content easier than ever; Inaugural product boosts productivity and impact for creatives. Smashworks designs and develops tools for content creators that minimize time spent working while also maximizing impact. Smashworks, a pioneering new product development company focused on the singular vision of designing video editing tools that work with Adobe Premiere Pro to make content more stimulating, interesting and engaging, today launches its inaugural product, HandPainted. Smashworks designs and develops tools for content creators that minimize time spent working, while also maximizing impact. Smashworks products are designed to enhance video content including short and dynamic social media clips, personal and elaborate wedding videos and film projects, company presentations, as well as commercial work designed to make immediate impression on customers and clients. Hand Painted, Smashworks’ inaugural offering, is a new feature-rich, Adobe Premiere template that provides creators with a tool set that will automatically make any font look authentically hand painted, as well includes 50 hand painted customizable animation elements that add visual interest, taking any project to the next level. Hand Painted seamlessly integrates text presets and motion packages right into Adobe Premiere, dramatically reducing the time spent switching between software, and increasing productivity. Any font can be incorporated into the product, meaning designers can create incredibly customized projects while saving time to maximize their budget. 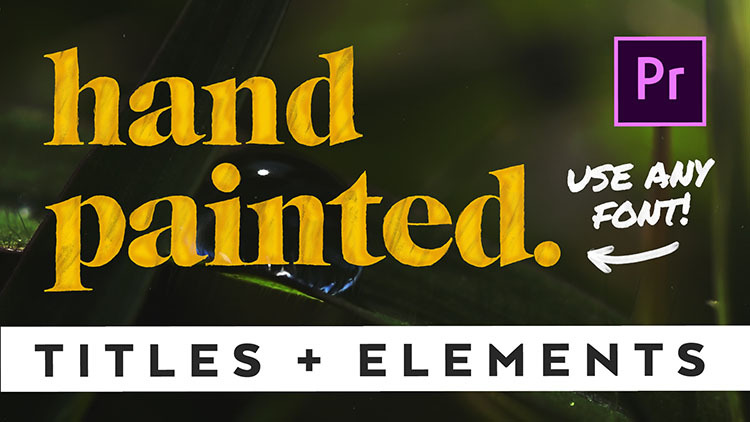 The Hand Painted element packs now also work with Final Cut Pro. Hand Painted is available now for $34.95 directly from Smashworks. Prior to Smashworks, Schlachter was involved in the founding of several companies and served as board member and executive advisor for many other emerging growth ventures. Company founders include Austin Faure, who launched one of the world’s earliest and largest viral sensations, ‘Molly The Owl’, a live online broadcast and documentary series that followed a family of wild barn owls; as well as filmmakers and content creators Noah Crider and Parker Schmidt. Smashworks was founded by three industry creatives who saw an opportunity to provide seamless, easy-to-use products that enhance content creation for prosumers, enthusiasts and professionals alike. Smashworks’ products minimize time spent on producing projects while ensuring that creatives will be able to expand their abilities and production value. To learn more, visit Smashworks’ website smashworkshop.com, on Instagram .